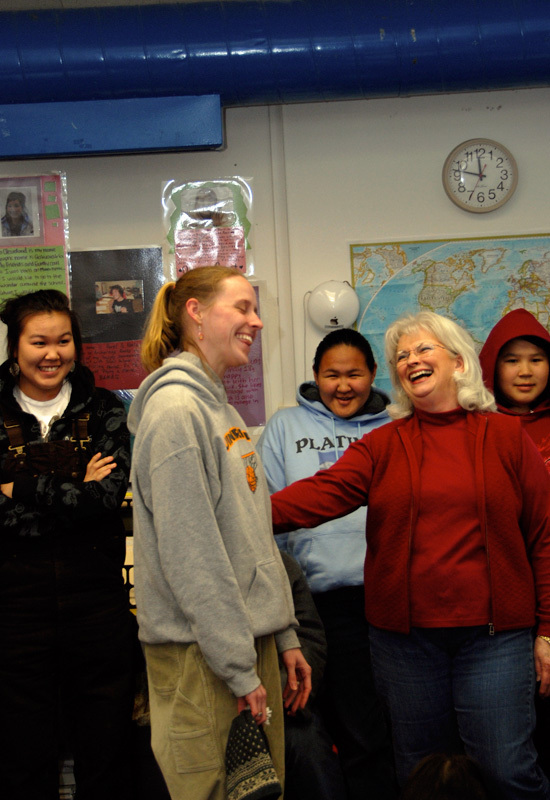 Sherry Marousek-Pederson is a housewife from Quinhagak, Alaska, an Eskimo village located on the tundra 400 miles west of Anchorage. The population is 750 and there is one store, which does not carry fresh produce on a consistent basis. 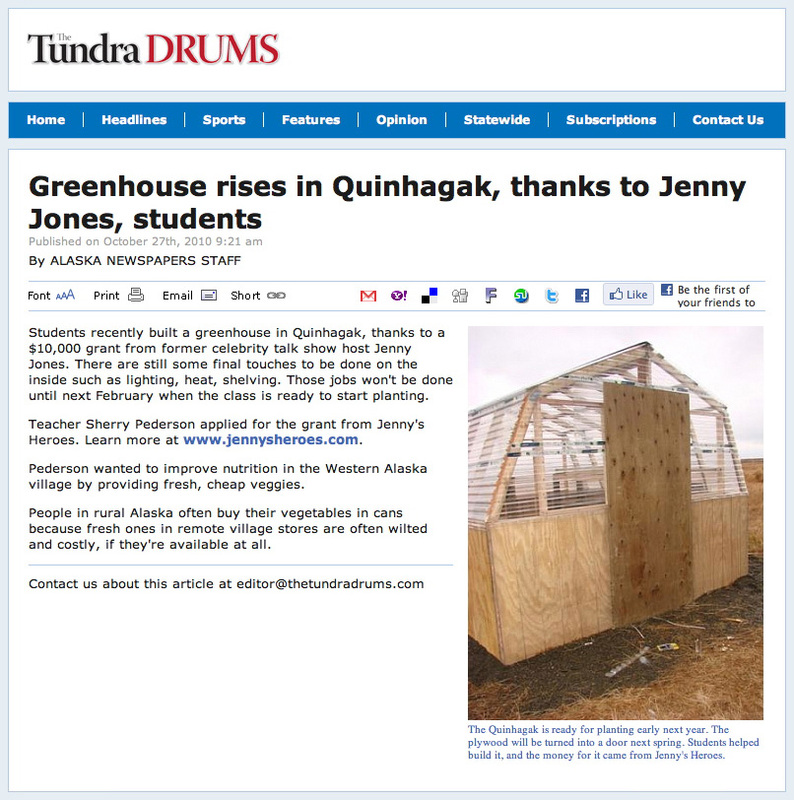 Sherry requested $10,000 to build a greenhouse for the 200 students from kindergarten through 12th grade at Quinhagak School, Kuinerramiut Elitnauviat. 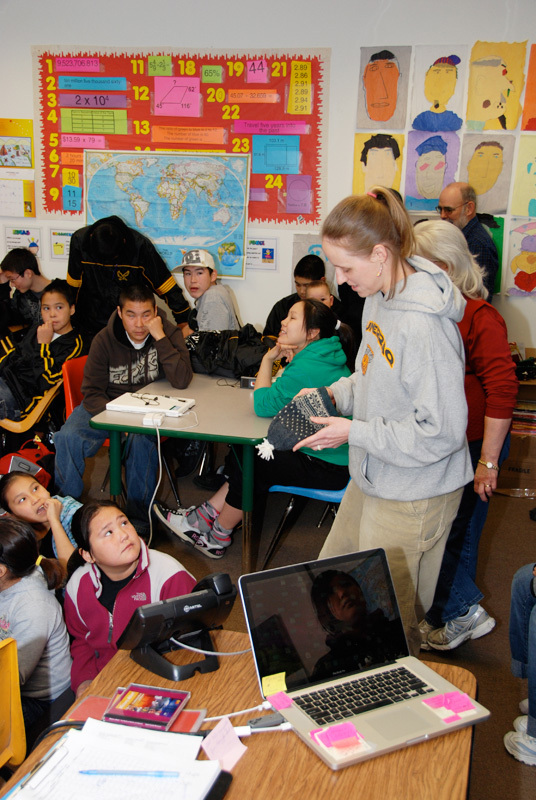 Besides learning how to grow food, the students will also share their harvest at community feasts and school lunches. "I recall one time a young 12-year-old boy who never saw or tasted a grapefruit," Sherry wrote in her application. "When I was a teacher, I had a student who thought grapes came from grape juice because she had never seen grapes. 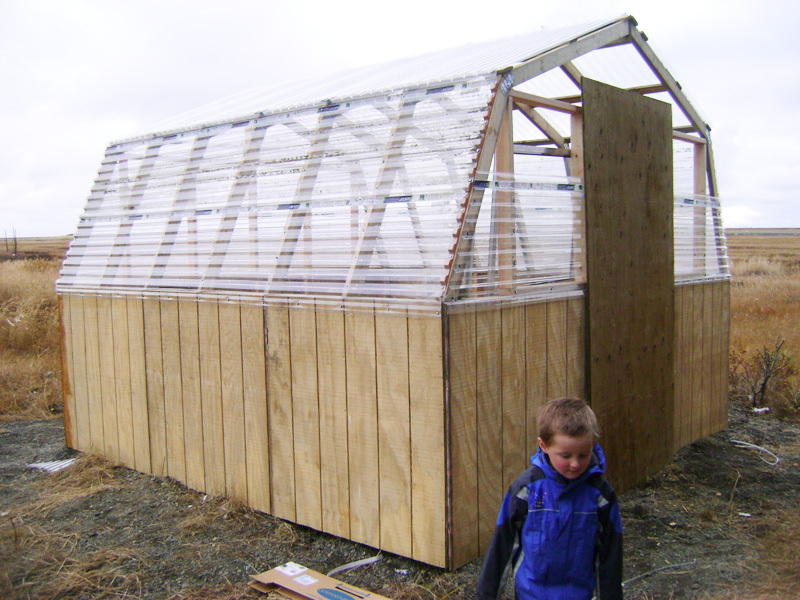 I strongly believe that a greenhouse would open up a whole new world for students." There are no roads leading to Quinhagak so everything comes there by plane or barge. Sherry says it’s more economical to barge in the greenhouse equipment so her budget includes the extra $2,000 to get the materials there. Currently, Sherry is on a year of absence from teaching English Language Development to stay at home with her two children who are 2 years old and 8 months old, but she still finds time to be involved with a variety of things. 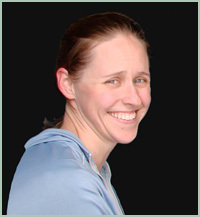 Last October, she organized a 5K Salmon fun run for the village that had 100 runners. 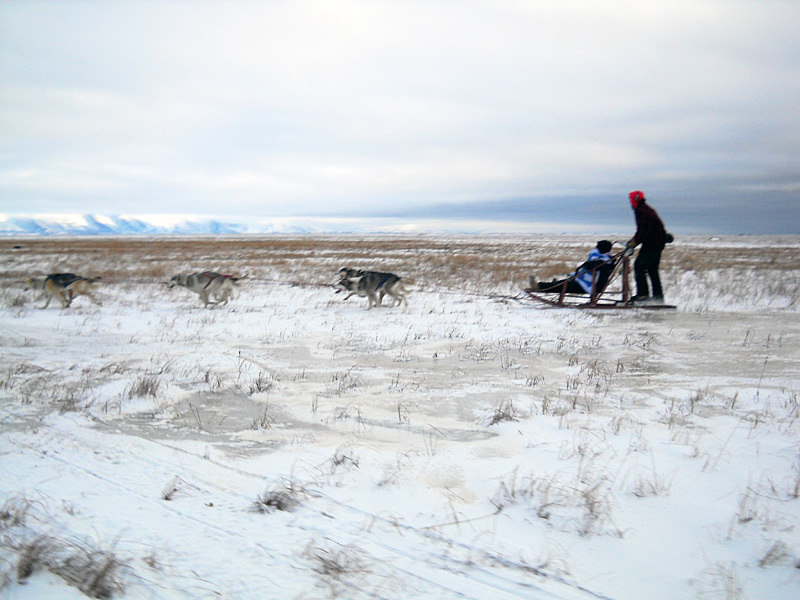 She and her husband, Eric, are also recreational mushers. "My main priority are my children and enriching their lives as much as possible while living in a village with limited opportunities." 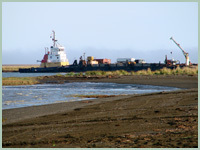 Quinhagak is on the Kanektok River on the east shore of Kuskokwim Bay, less than a mile from the Bering Sea coast. 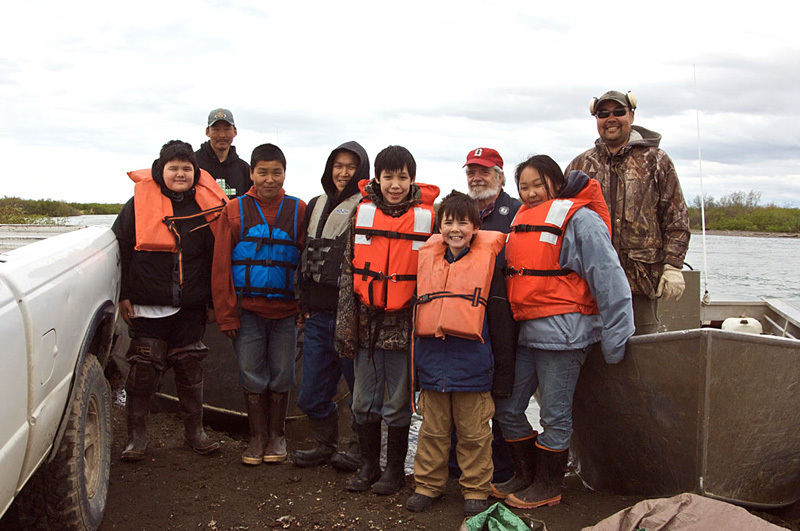 The Yup'ik name is Kuinerraq, meaning "new river channel." 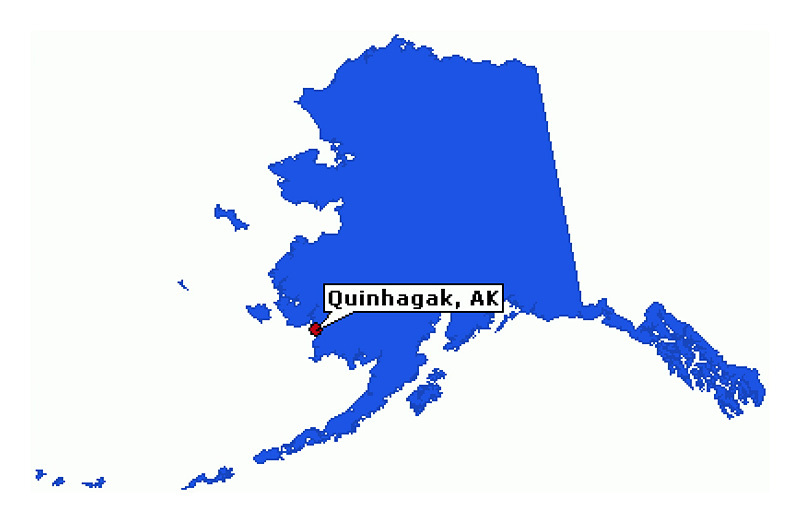 Quinhagak is a long-established village whose origin has been dated to 1,000 A.D. 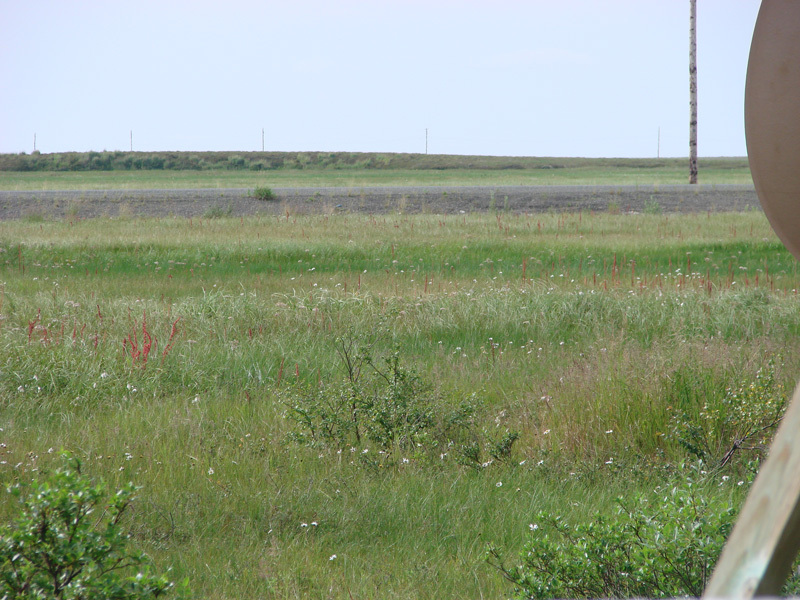 It was the first village on the lower Kuskokwim to have sustained contact with whites and first appeared on a map in 1826. 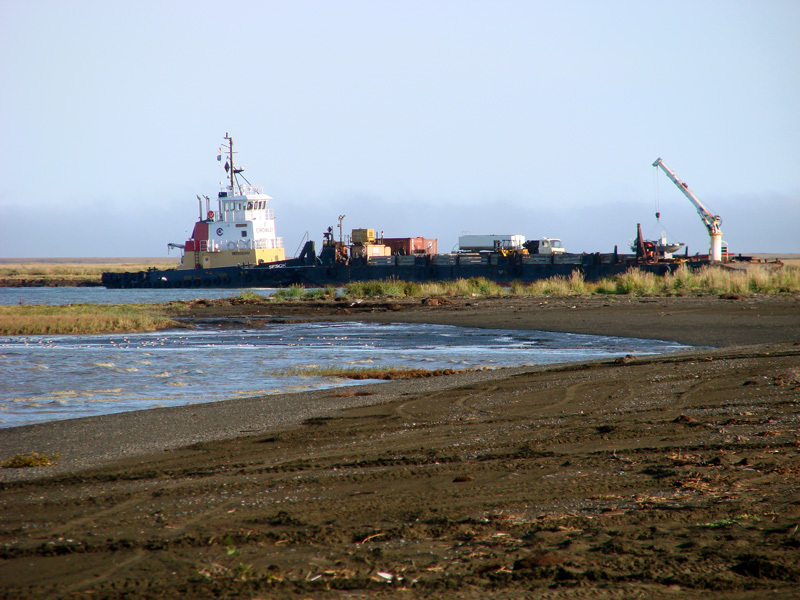 After the purchase of Alaska in 1867, the Alaska Commercial Co. sent annual supply ships to Quinhagak with goods for Kuskokwim River trading posts. 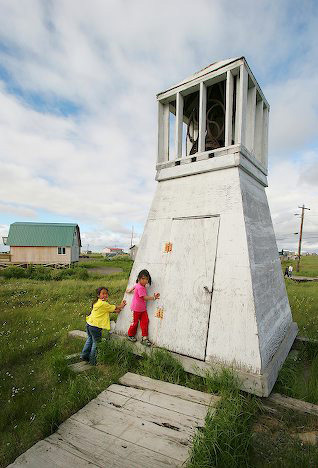 There were many non-Natives in the village at that time; most waiting for boats to go upriver. 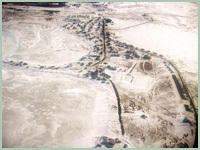 In 1904 a mission store opened, followed by a post office in 1905 and a school in 1909. 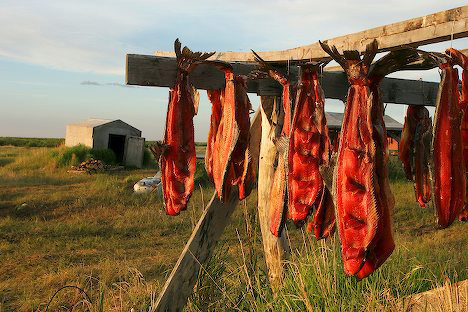 Between 1906 and 1909, over 2,000 reindeer were brought in to the Quinhagak area. 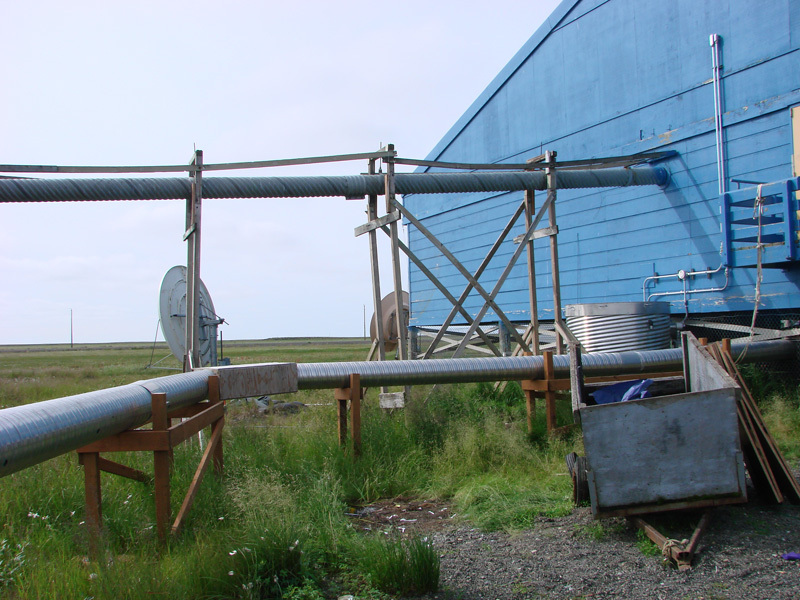 They were managed for a time by the Native-owned Kuskokwim Reindeer Company, but the herd had scattered by the 1950s. In 1928, the first electric plant opened and the first mail plane arrived in 1934. 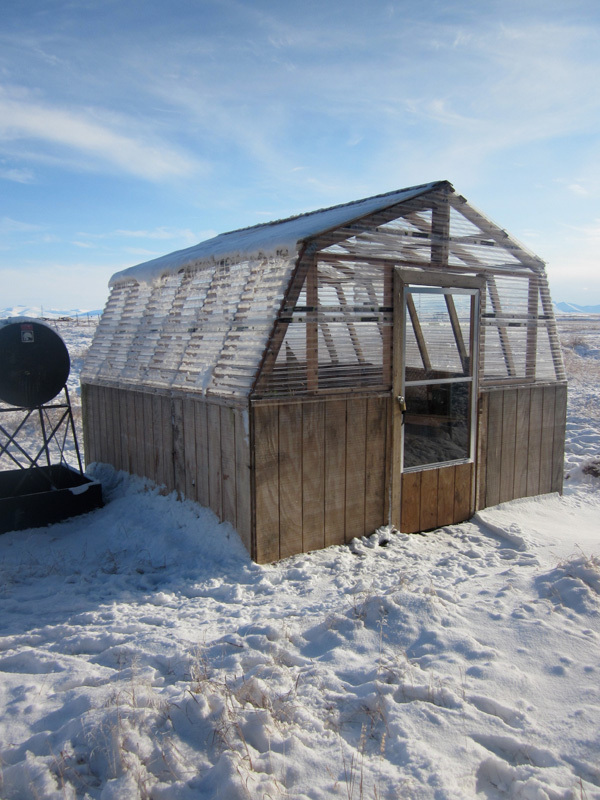 "We have the greenhouse up and running now. Currently, the 6th grade class has seedlings in the greenhouse. As you can see, we have plenty of snow here. We were hit by an Easter blizzard yesterday. 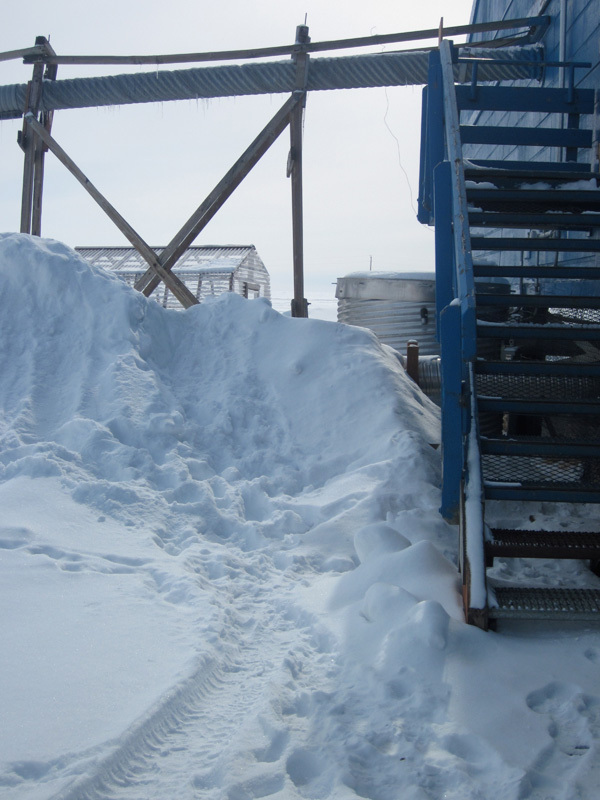 You can see the path that we have to take in order to access the greenhouse....we have to go over the pipe. The special education class started seedlings in their classroom and will bring their seedlings to the greenhouse at a later date. 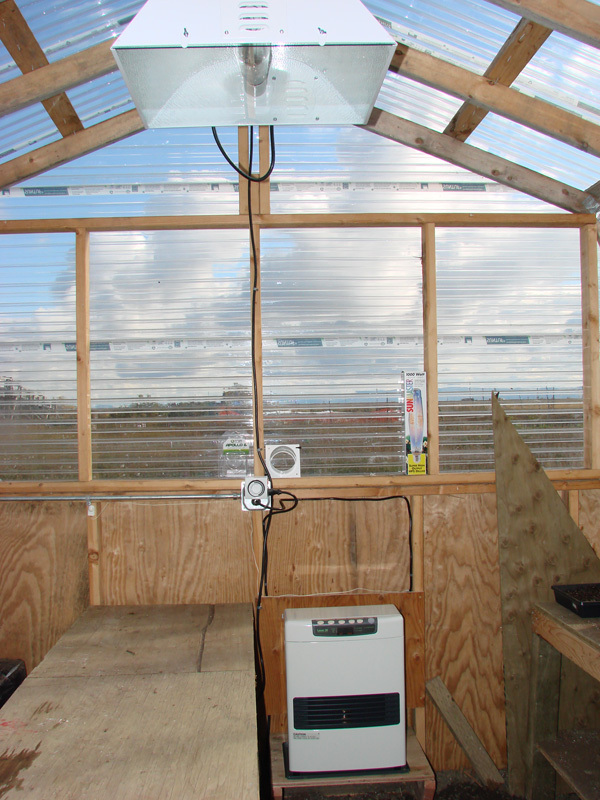 We have the toyo stove running to help keep the greenhouse warm. Best regards, Sherry"
"I am closing the greenhouse for a few months. We had an early cold snap that is lasting longer than usual. The lightbulb burned out before we could get the toyo stove up and running. We were able to harvest some carrots, spinach, dillweed, and beets. One student took a few plants home. A classroom teacher took some of the other plants. Hopefully, the plants will continue growing indoors. We will start up again in February which gives us the next few months to fix the minor problems with the greenhouse as well as order new lightbulbs, etc. Have a wonderful holiday season and I will be in touch again in the spring where I hope to have our first full successful season. I know it has taken a couple of years to get this greenhouse up and running but I appreciate your patience and support. Best, Sherry"
"Sorry that it has been months since my last email. 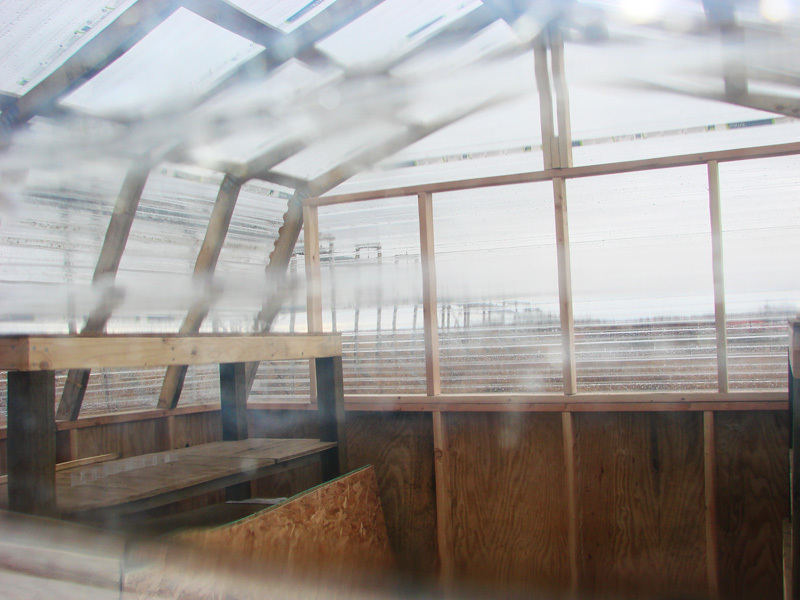 Unfortunately, the greenhouse was broken into over the summer. Nothing was damaged but plants were severly overwatered and did not survive. 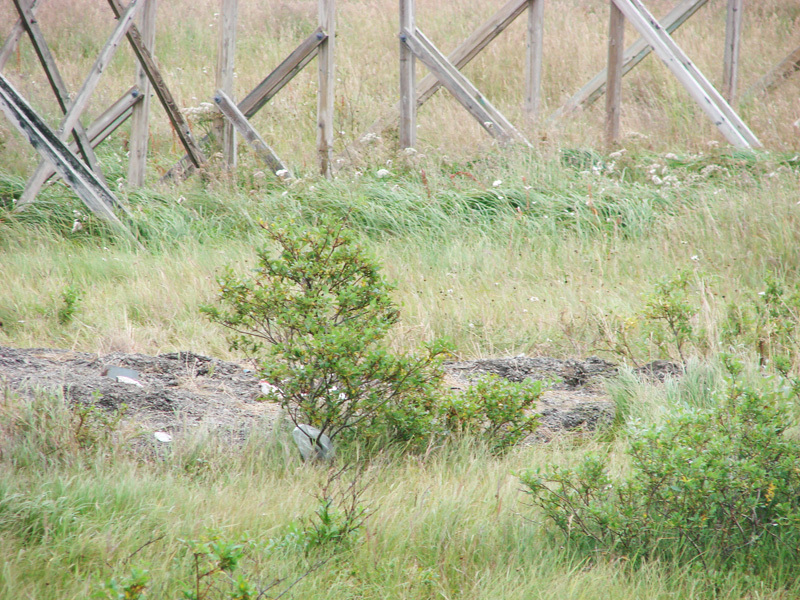 A bag of soil was dumped as well. 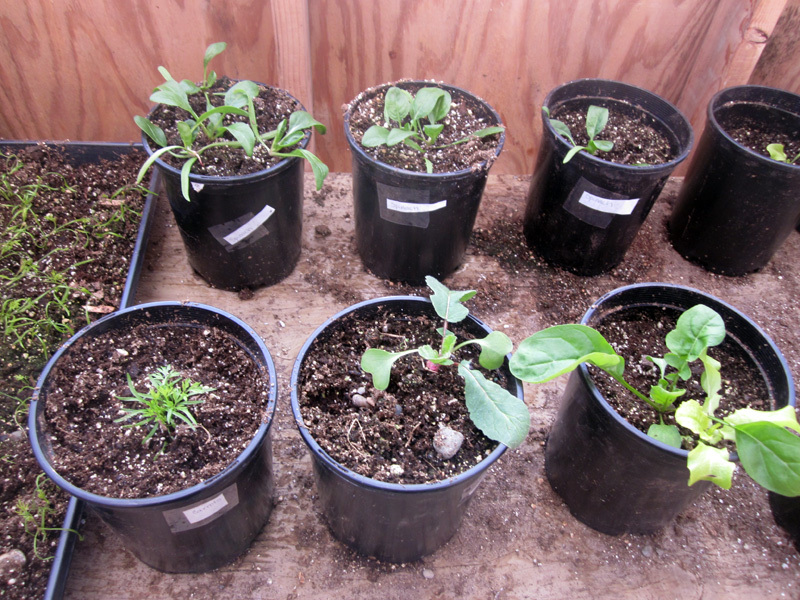 We cleaned everything up and put the spilled soil into pots for new seedlings. The school purchased a new door for the greenhouse. The lights and toyo stove are hooked up. Seedlings are starting to grow but can't be seen in the pictures. I am hoping for a late harvest and am confident that the lettuce, spinach, herbs will be ready. 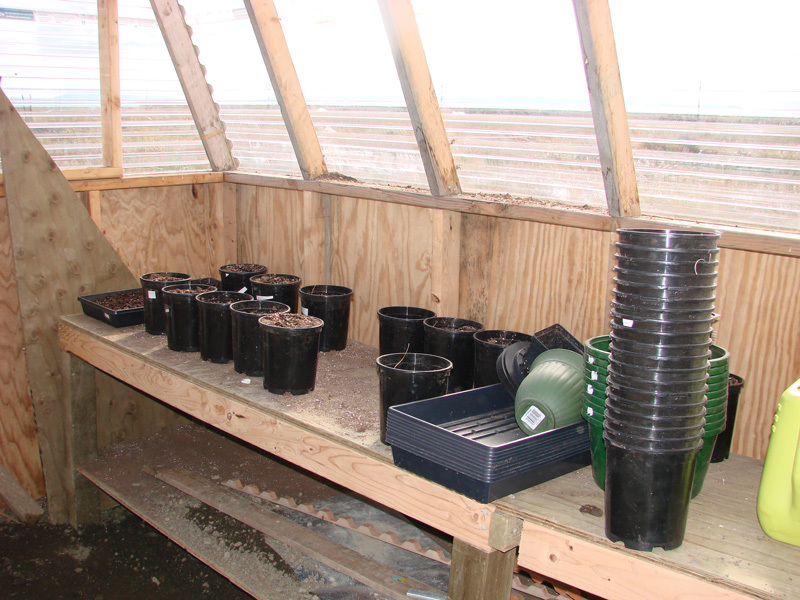 I have attached pictures of the greenhouse and plants. I am also in the process of arranging student interns at a greenhouse next summer. I am really hoping that the students will return to Quinhagak with a green thumb for planting and leadership. My goal is to have the students be in charge of the greenhouse next fall. Sherry"
"It has been a busy spring. Greenhouse update. Classrooms have started their seedlings. 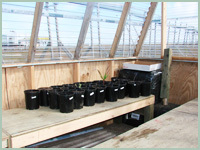 The plants remain in the classrooms as we wait for the greenhouse door to be installed with a lock. 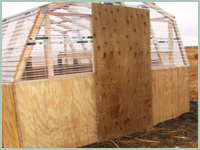 Currently, there is a large sheet of plywood nailed to the greenhouse. 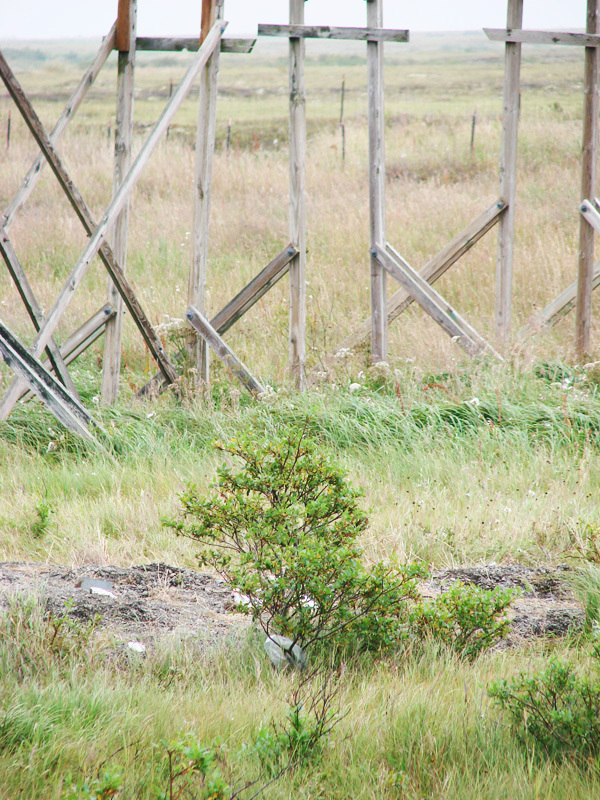 In recent weeks, there have been numerous incidents of vandalism around the village. We want to make sure there is a secure lock on the greenhouse door to prevent younger kids from walking in and causing destruction. The goal is to have the door and lock installed next week so that students can bring their seedlings to the greenhouse. 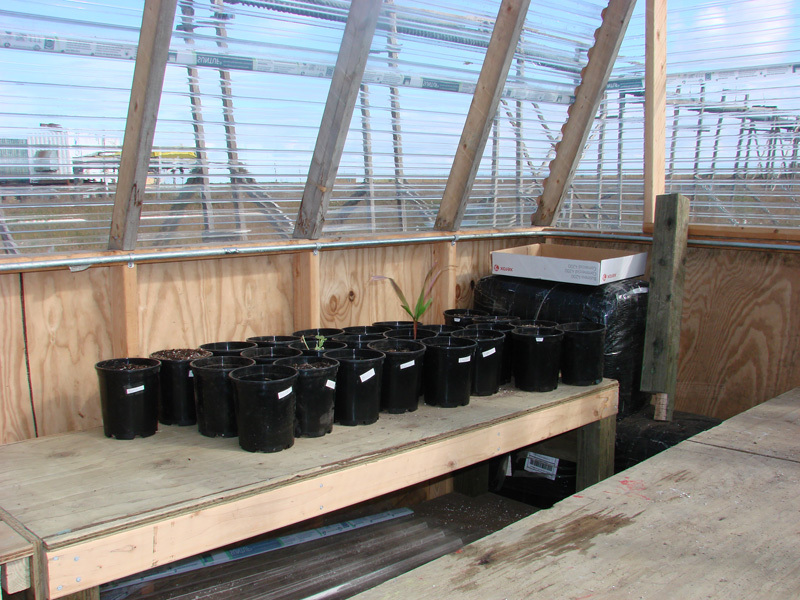 School ends on May 19th but the plants will remain in the greenhouse. The goal is to have a team effort with watering the plants over the summer so that students can harvest the vegetables when they return to school. I will be watering the plants during my time in the village. While I am visiting family, we will pay a student to water during the month of June. Another teacher volunteered to water the plants with her students during summer school for July. 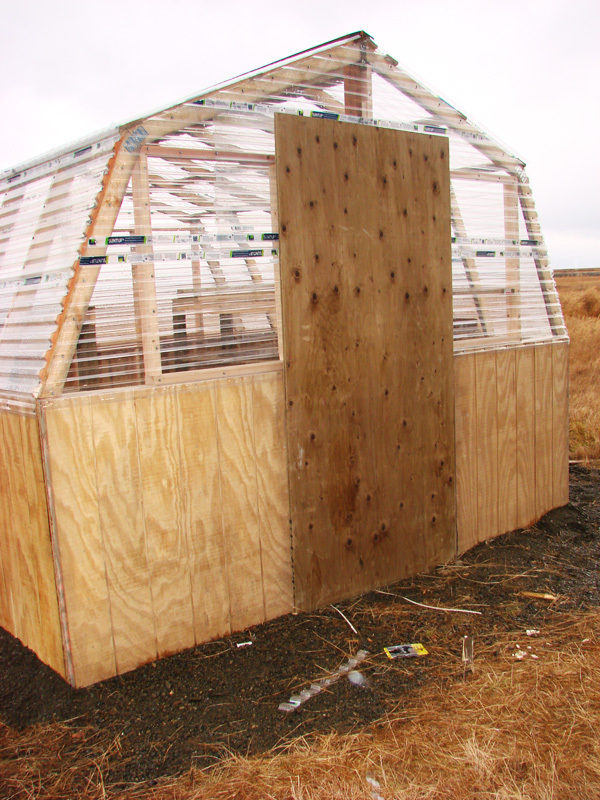 Other exciting news is that the tribal council president of Quinhagak put in a grant for five thousand dollars to purchase materials to expand our greenhouse. So we are waiting to hear if the grant has been approved. 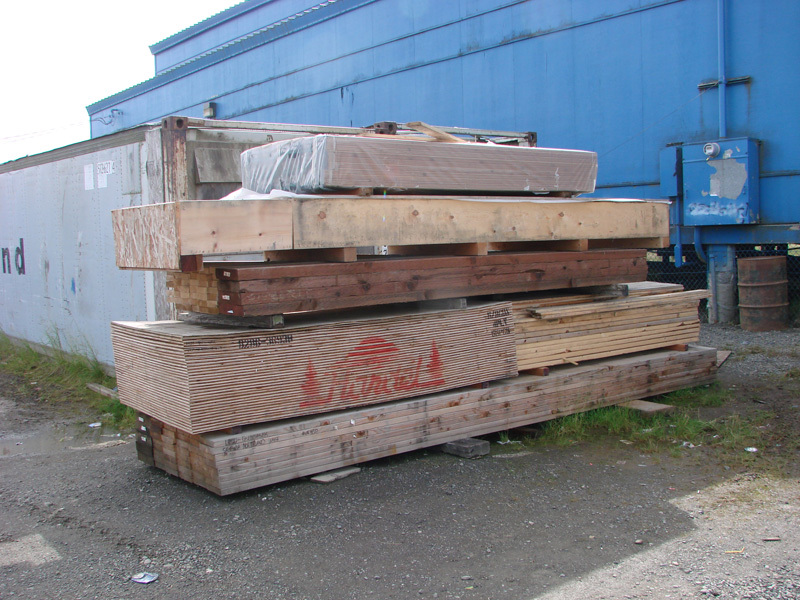 If so, the council will pay for freight costs. I hope to get pictures of the greenhouse with plants inside next week. Hope you are having a great spring! 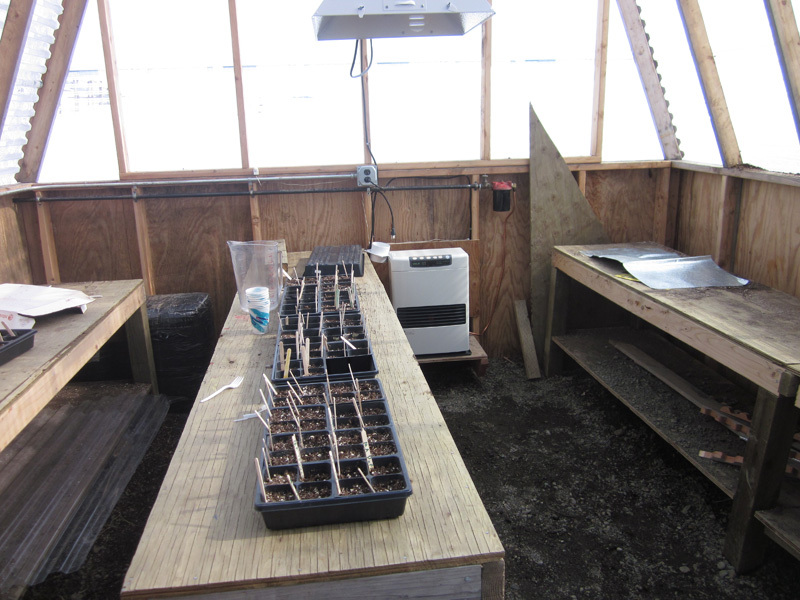 "I attached a couple photos of the greenhouse. We just finished building it this week. There are still some final touches to be done on the inside such as lighting, heating, shelving. Those jobs won't be done until next February when we get ready to start planting. There is plywood over the door because the greenhouse screen door is fragile and breakable. 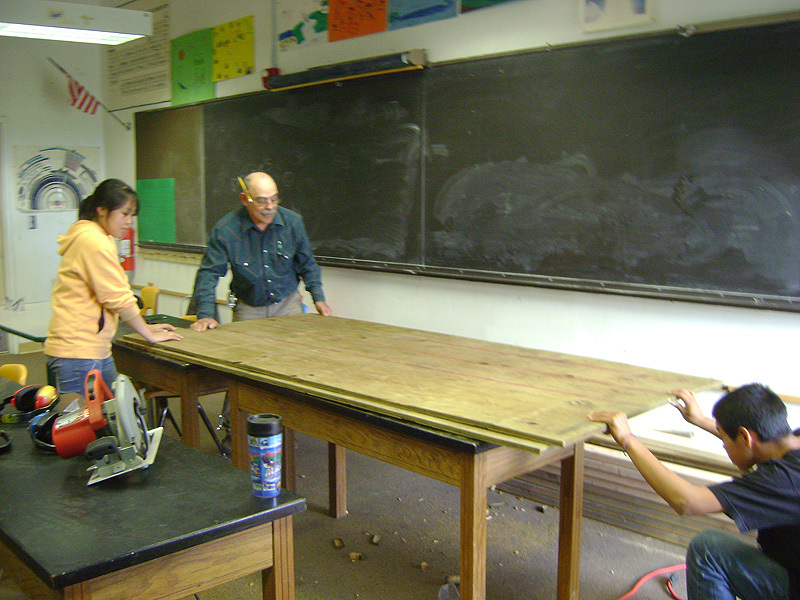 The plywood will be turned into a functioning door next February. Thank you so much for this opportunity! Sherry"
"Hey Guys, Some more updated photos of the greenhouse. 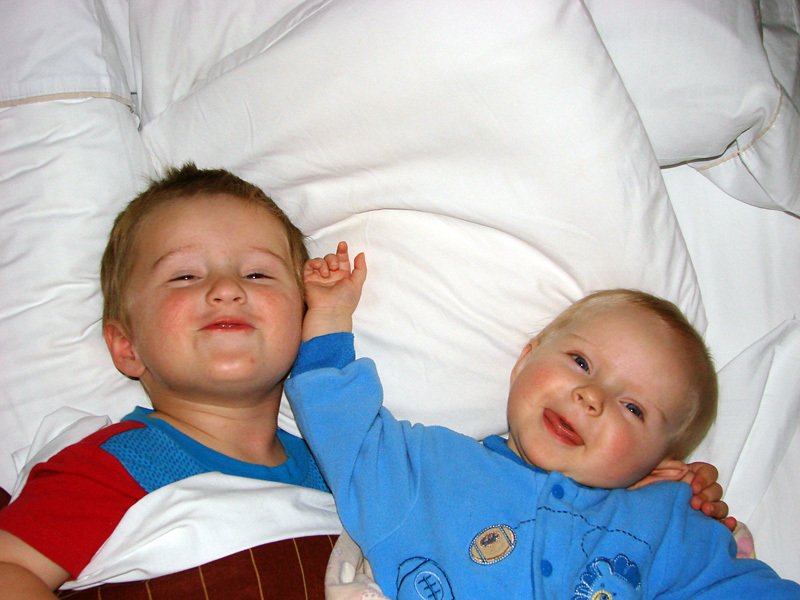 That's my son, Einar, in the photo. The plywood door is there as added reinforcement for the sceen door. I also shot a photo of the inside. Dennis thinks it will be finished in a week or so. Though he will not install the heat and lights until next Feb. when we start the seedlings. 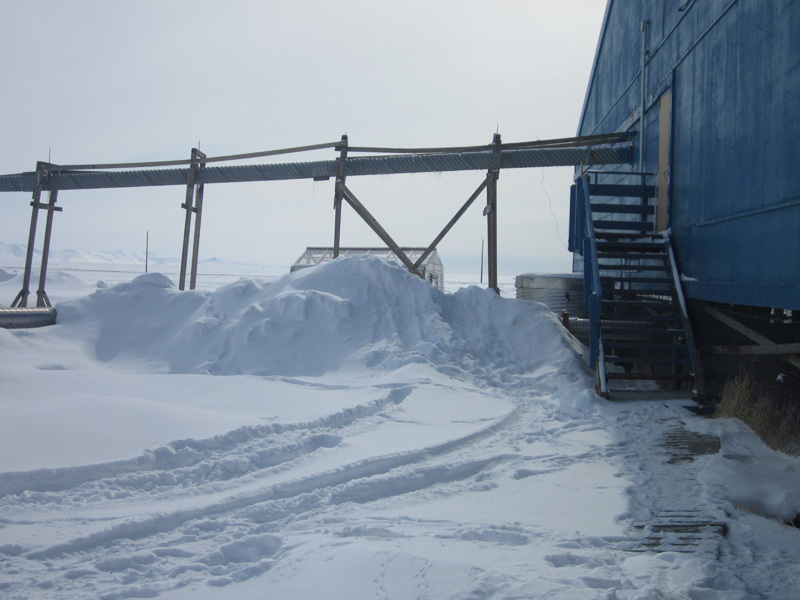 This will give us the winter to see how the structure deals with winter storms and if we need to make any changes. As always many thanks! Sherry "
"Here are some photos of the high school kids working on the greenhouse. The structure is starting to take shape outdoors. Yes, that is snow in the background. We received our first snow fall last week on Sept. 29th. At this point, it is looking like we will have our first harvest next spring. Thanks again for this opportunity!" 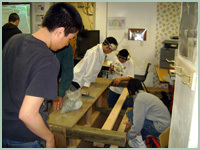 Sherry sent us some photos of the students and Dennis Seaton, the woodshop teacher, working on the inside components of the greenhouse. 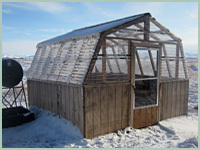 Sherry placed an order for a toyo stove to heat the greenhouse, today. She also sent us photos of the gravel pad that was put in last week by Dennis Seaton, and his woodshop class, to create the foundation for the greenhouse. "I am back in the village. 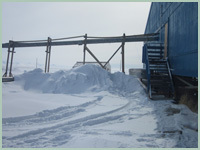 Here are some photos of the greenhouse supplies at site. 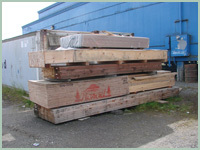 The large pile is a combination of the greenhouse and wood for another project for the woodshop class. The smaller two piles are for the greenhouse. Yes, one has a boat. 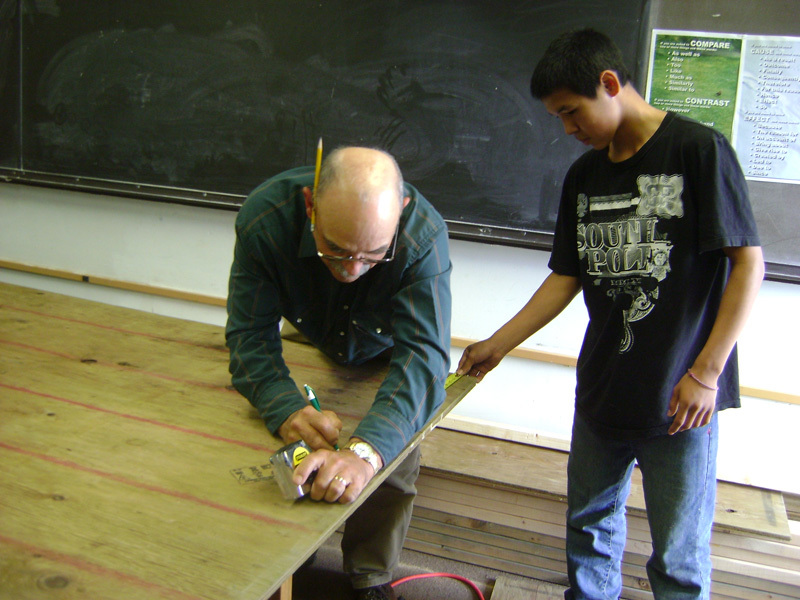 Dennis Seaton will be building the greenhouse with his woodshop class. It is his boat on top of the pile. His house is right there. 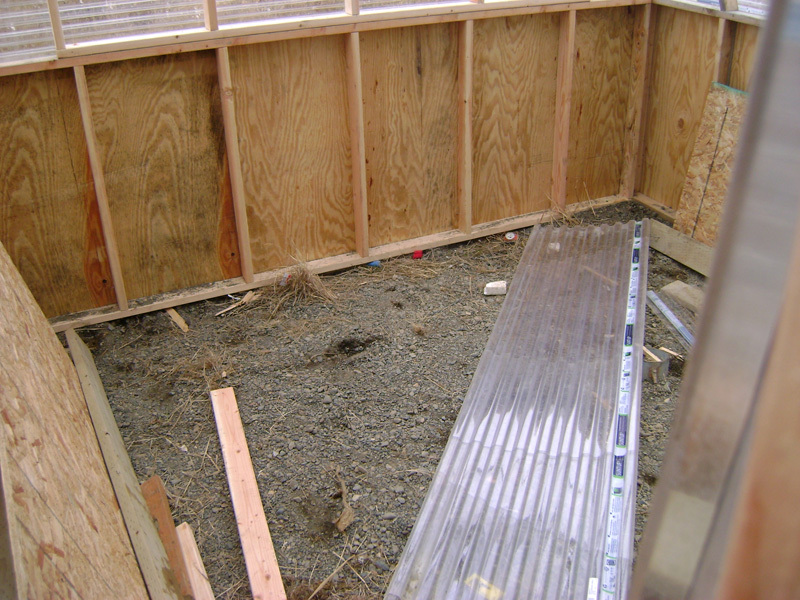 I also included two photos of where we will be putting the greenhouse. One is an upclose photo. The other one shows a better perspective as to where the greenhouse will be in relation to the blue school building. 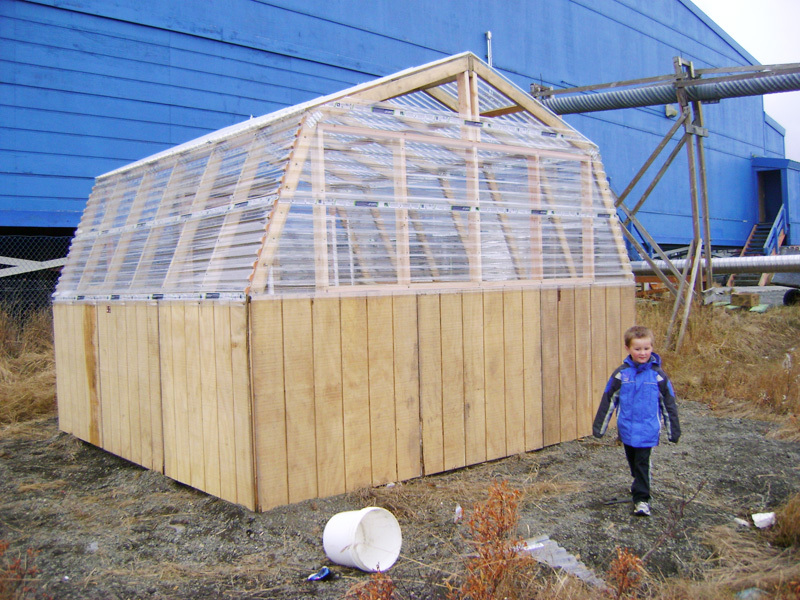 Monday, August 16th, is the first day of school and Dennis plans on starting on the greenhouse. Expect more pictures. I know I have some money left over which I plan on using for light and heat. I expect to make a purchase in a couple of weeks." "We are having a late spring thaw. We had 2 inches of snow last Sunday. 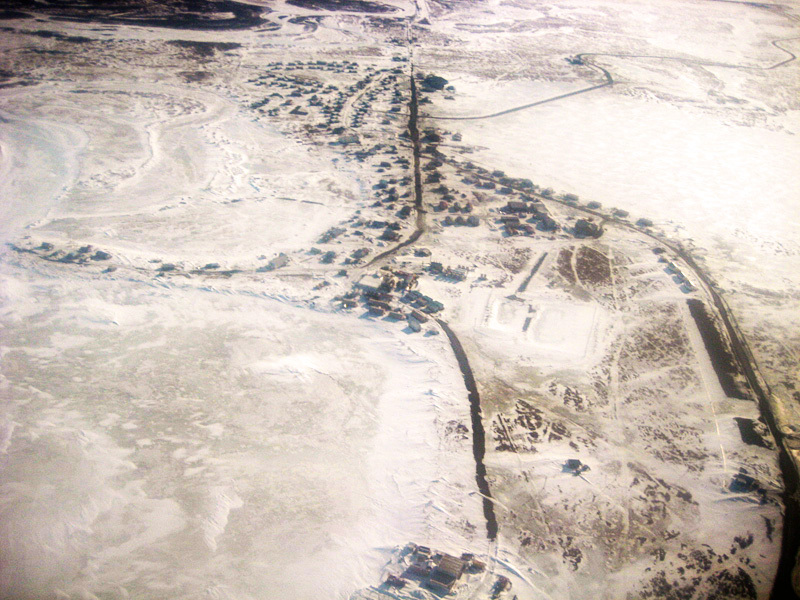 The Bering Sea and parts of the river are still frozen. Naturally, no barges are coming. 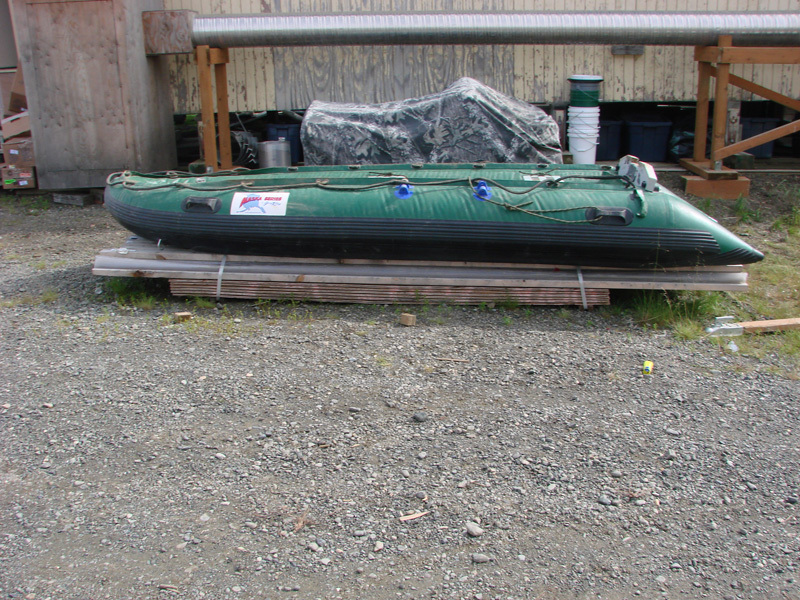 I am thinking that it will be another 2 or so weeks before the first barge and the greenhouse comes in. School ends May 18th. So the greenhouse will not be built this spring. I should be able to take pictures of the barge coming in. I will email those to you when it happens. 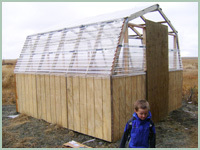 Then the greenhouse will be stored at school until August when school starts up again. It will be built then and I am hoping for a late fall harvest. Thanks again for the grant." Spring has arrived and Sherry has just ordered her greenhouse! 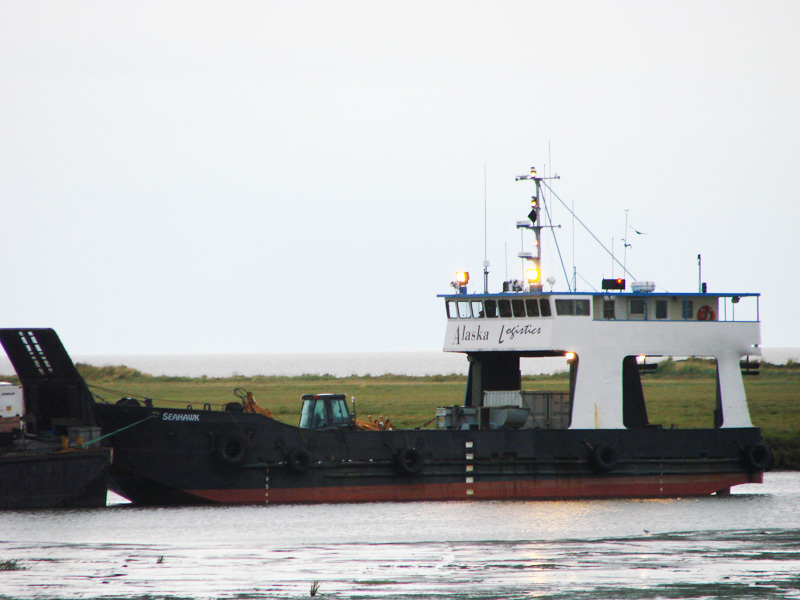 It will be on the first barge which is in early May. 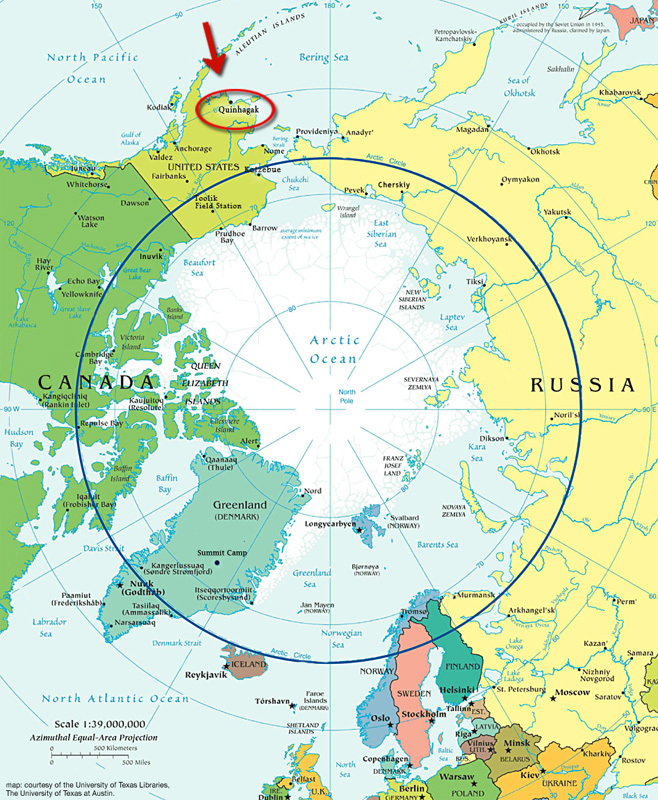 It all depends when the oceans break up as everything there is still frozen solid. "I think shock is a better word to describe how I felt. Though on a year of absence, I agreed to continue to be the site’s testing cooridinator. I have a ten day contract to take care of state testing, ELPT, and HSQUE. Eric told me that Sara Pryzsblski had to talk to me about ELPT and ELD identification and set up a phone conference on Thurs. November 19th at 11:45. Eric would have Cindy watch the kids. It would be really quick….15 minutes. He picks us up in the new dark navy suburban and we go to school. Eric tells me his office is too cluttered but that Marsha’s room was free. 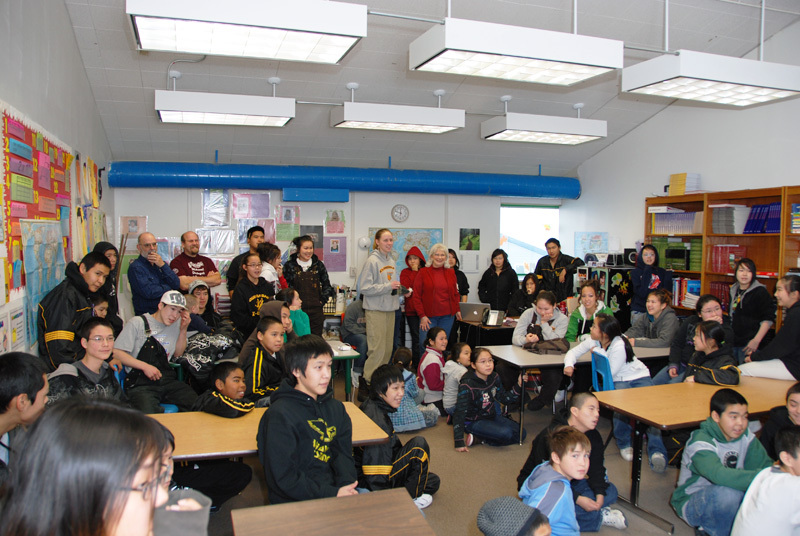 I go there and see that her room is packed full of students and it looks like they are watching something. I don’t go in because I don’t want to disrupt someone’s presentation. Eric tells me to go in. I say no…there are kids. Then I realize it is for me. Eric literally has to push me in and I look down. Jenny Jones is on the phone and tells me that she approved my grant. My new webpage is up on the board. Just shocked!!!!! 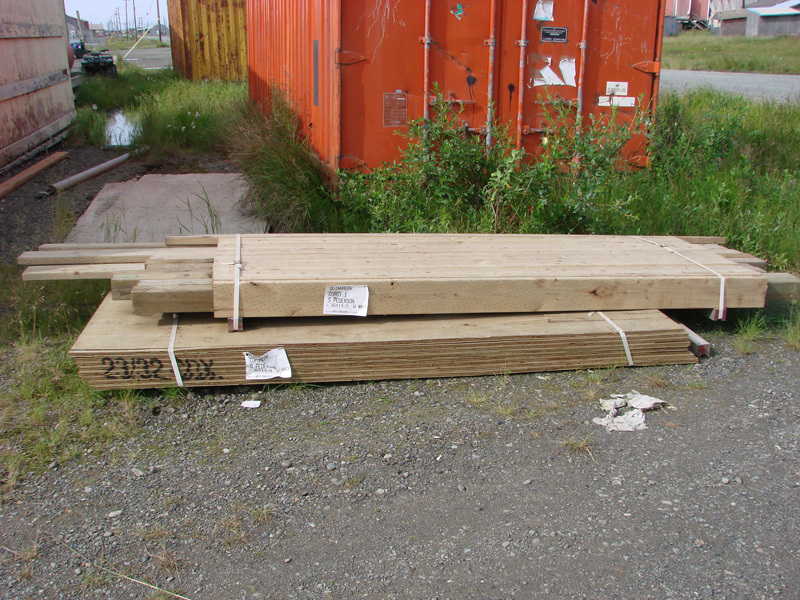 New project ahead of me…..a greenhouse for the school. It all still seems surreal. When I woke up this morning, I had to ask myself if it really happened or if it was just a dream. 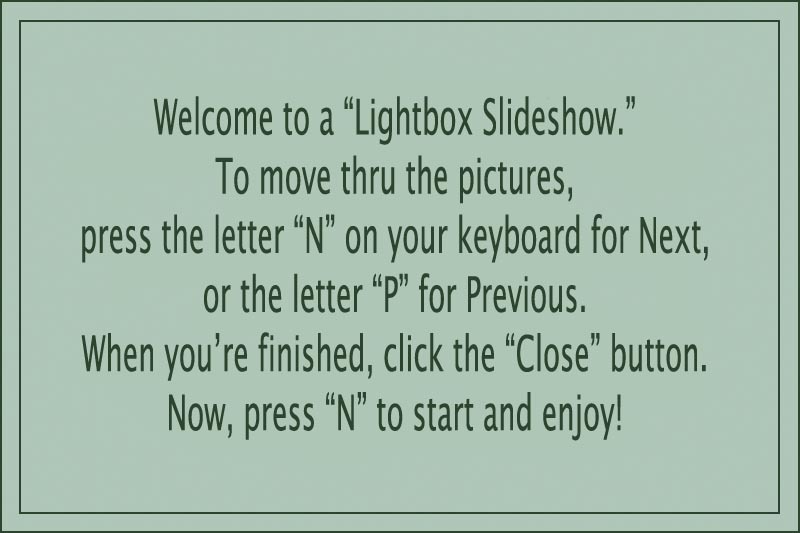 What a great way to find the news." Sherry tells us that the excitement is in full swing now. She's recovered from the shock of her big surprise and is working on getting her purchase together. 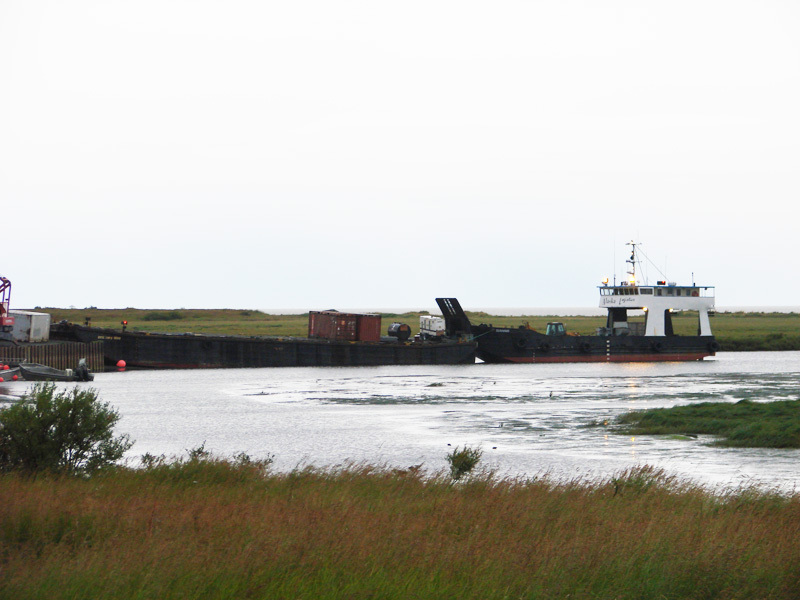 She sent us these five photos: The first is of the barge from last summer. It became stuck and was grounded. It had propane, which the village ran out of in July. Another barge had to come to take the propane off this barge. Fortunately, Sherry has an electric stove unlike some others who had to cook with campstoves and such. 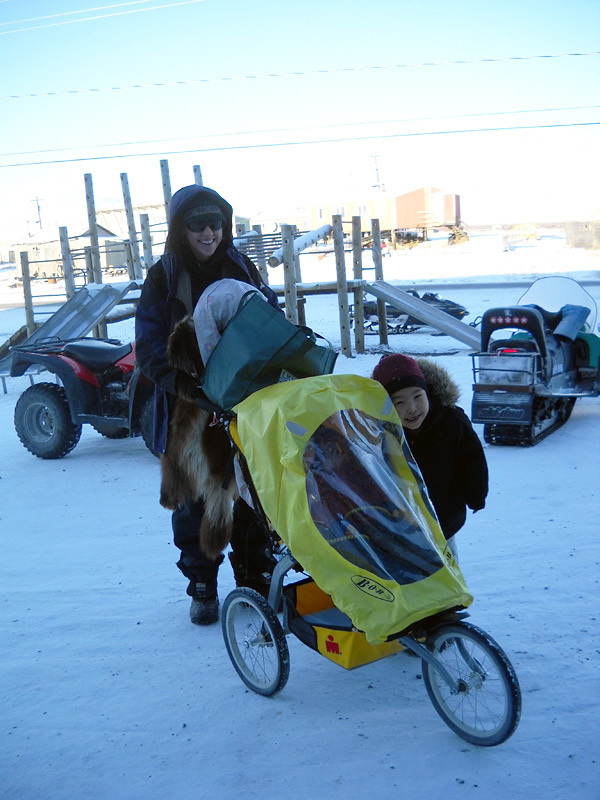 The second photo, taken a few weekends ago, is Eric mushing with Adela and Sherry in the basket. 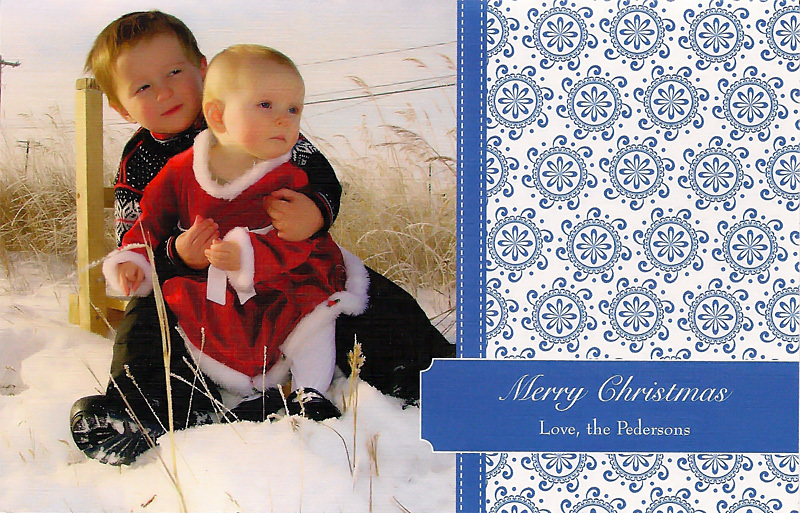 Third is a photo of their children. 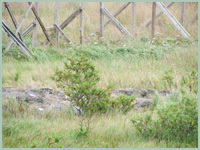 Photos four and five are of Sherry taking her kids for a stroll. 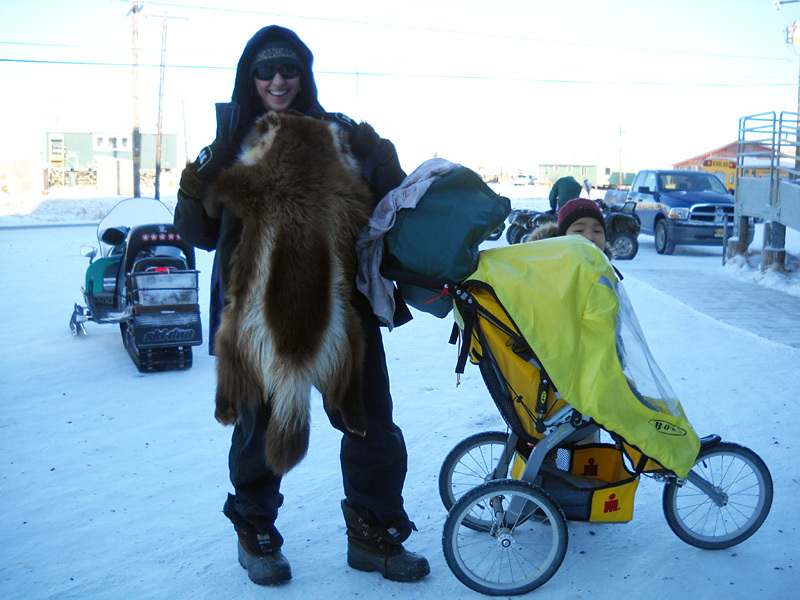 She uses a wolverine pelt to keep Adela warm, especially when it's windy. 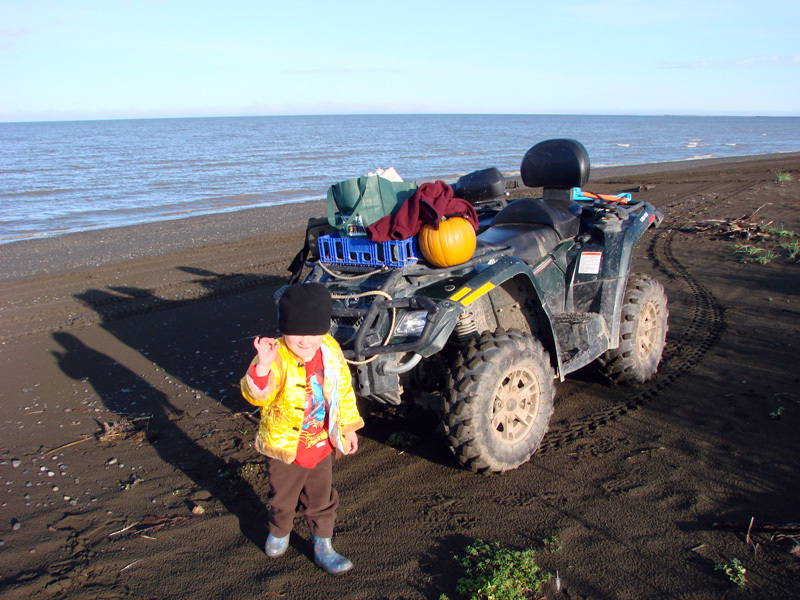 Einar is in the stroller. Sherry says winter has definitely arrived - It is currently 10 below zero! Sherry’s husband Eric set up my surprise call to Sherry today by bringing her in to a meeting at the school regarding some difficulty with the district office. 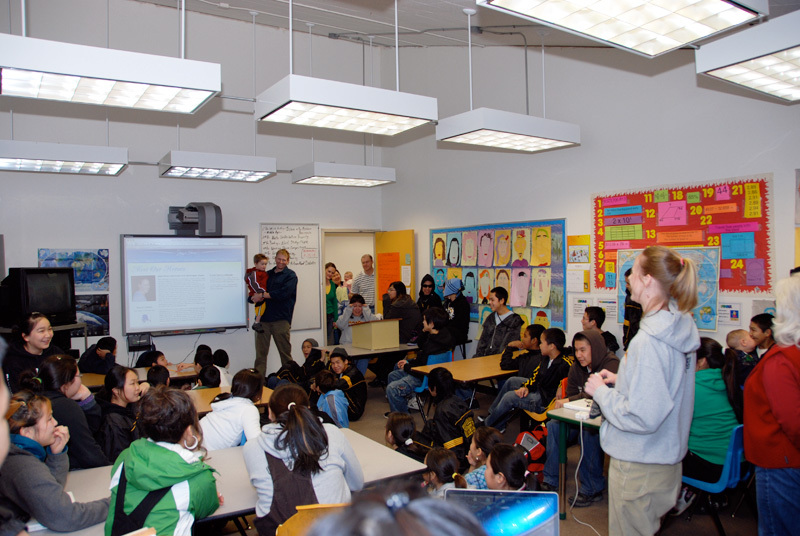 I was already on the speakerphone when she walked into the room and here’s what she saw: over 50 students, several teachers, and her web page up on the Smart Board. 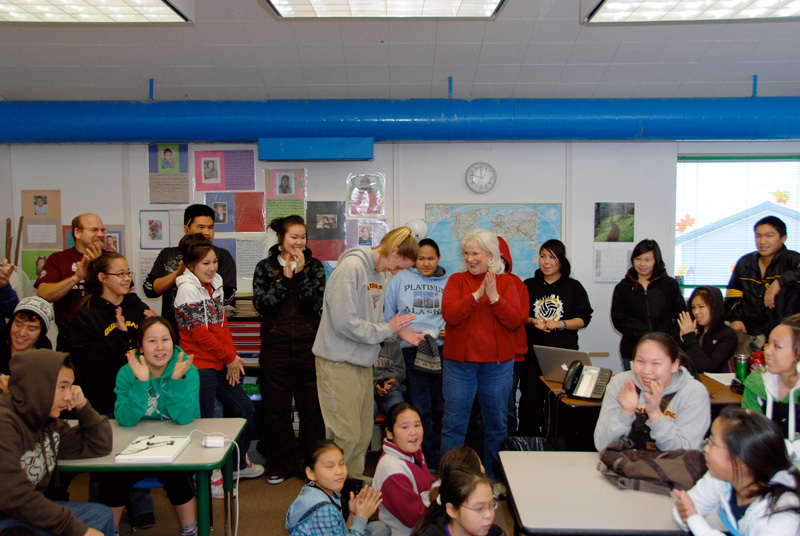 And there I was on the phone, along with reporter Alex DeMarban from the Tundra Drums. This was the first time a reporter asked to be on one of my calls and it was really fun. Alex was conferenced in from Anchorage. It was all a bit overwhelming for Sherry because she was truly surprised. 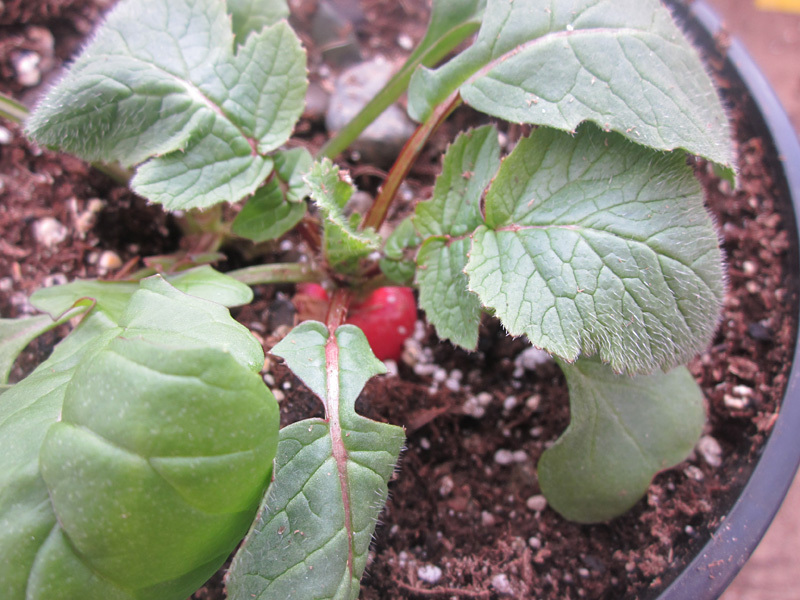 The children applauded the good news about getting a greenhouse, and Sherry said she plans to grow carrots, lettuce, spinach, tomatoes, radishes, green onions, and parsley. She believes that if the children grow the food themselves, they will be more likely to eat healthier as well. 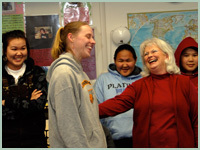 Although Sherry is from Connecticut and Eric from Wisconsin, they met at a teachers’ conference in Alaska, where they were both teaching at the time. They share an adventurous spirit and are now raising their family in this remote village with limited luxuries to be sure. 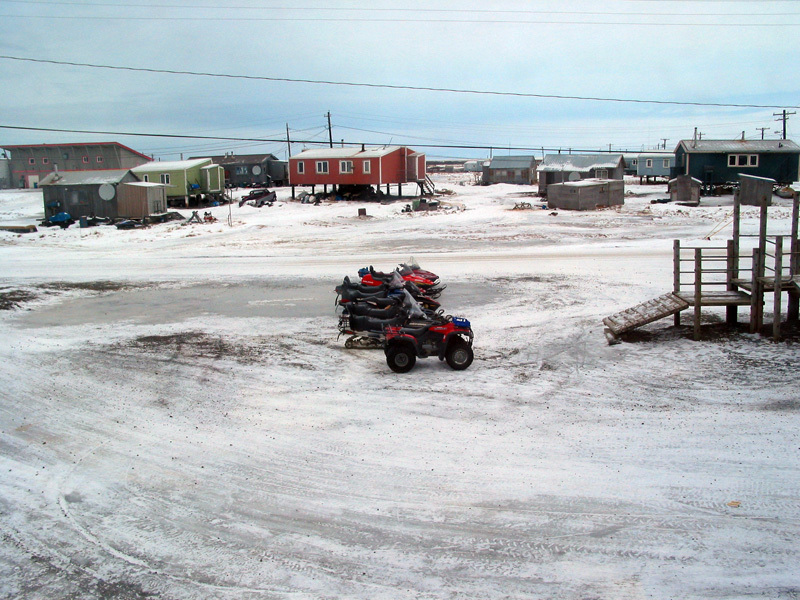 The houses there are built off the ground because of permafrost, which means the ground is always frozen. This is to prevent the heat from the house from melting the snow and sinking the house. Sherry’s house has no flushing toilets but she says the up side is there are no toilets to clean. In fact, very few houses there have flushing toilets, except for the school. Because of the cold, the barges won’t be running until the spring so that’s when the materials will arrive, but they will need some time to come up with a plan on how to built it to survive the elements. 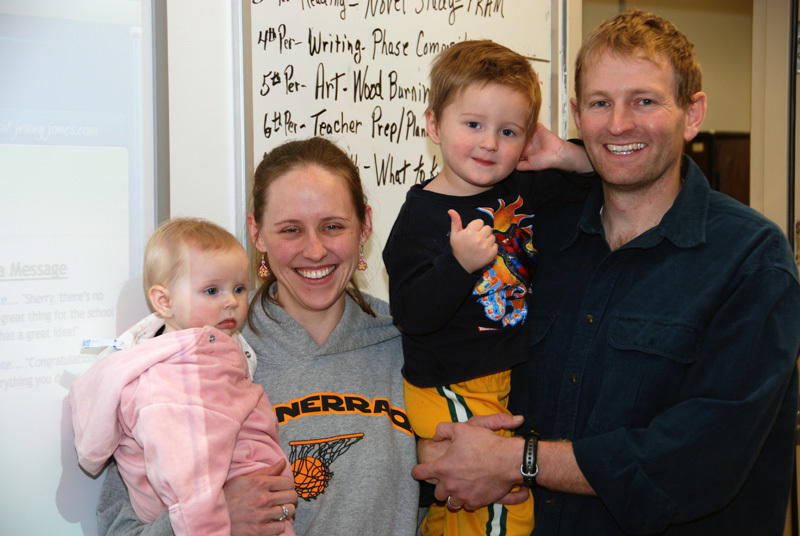 Sherry and Eric’s children are 2-year old son, Einar and 8-month old daughter, Adela. 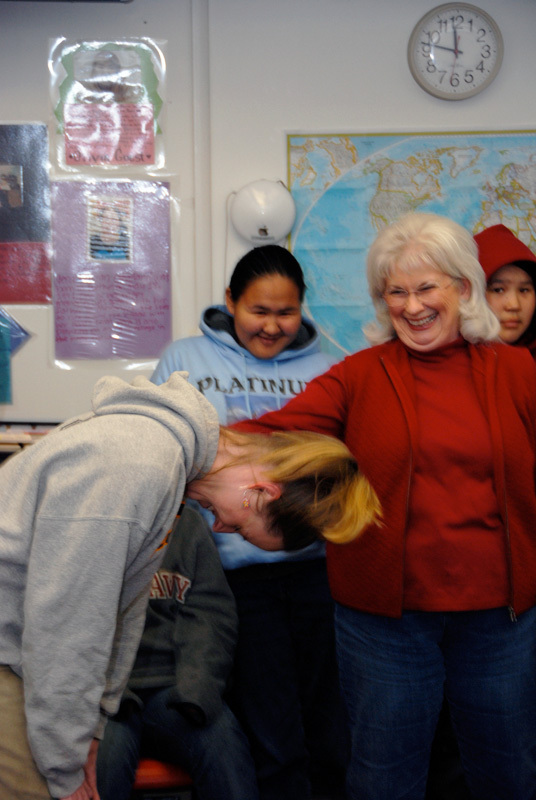 11/19/09: Jenny wrote... "Sherry, there’s no question this will be a great thing for the school and the community. What a great idea!" 11/19/09: Damon wrote... "Congratulations, Sherry! Thanks for everything you do for the people of Quinhagak." 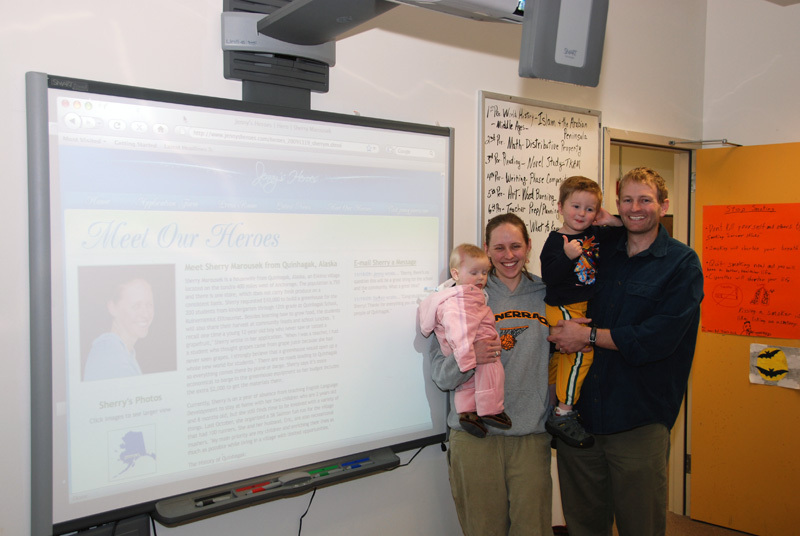 11/19/09: Allison Mathis wrote... "Sherry, you are amazing, you have always been my hero. 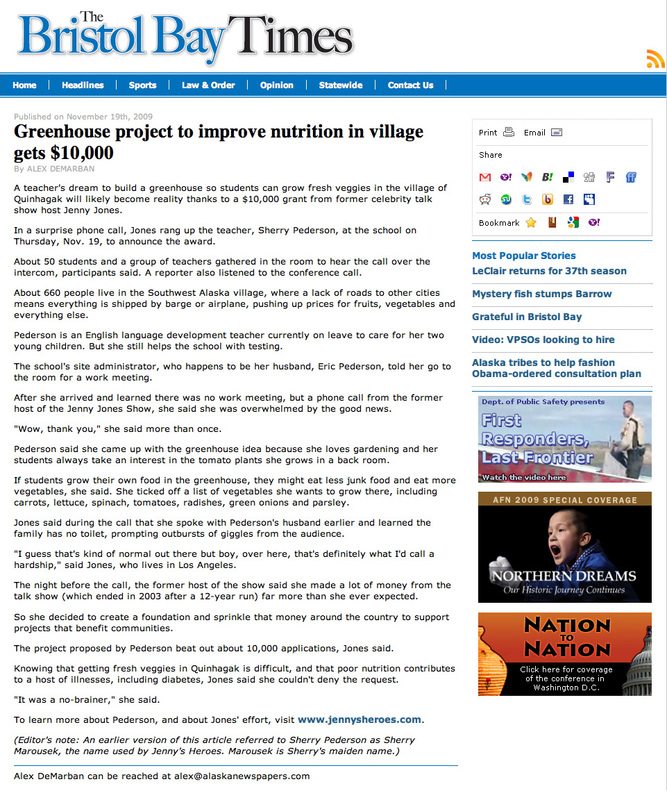 What a great thing to do for your village. I am so proud of you and excited for you!" 11/20/09: Casey Meyers wrote... "That is so cool! 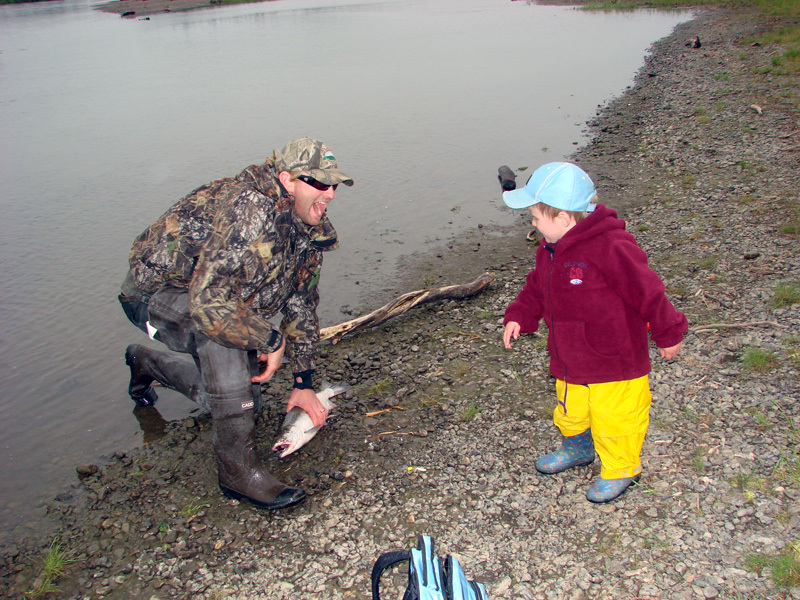 Come to Angoon and do the same thing." 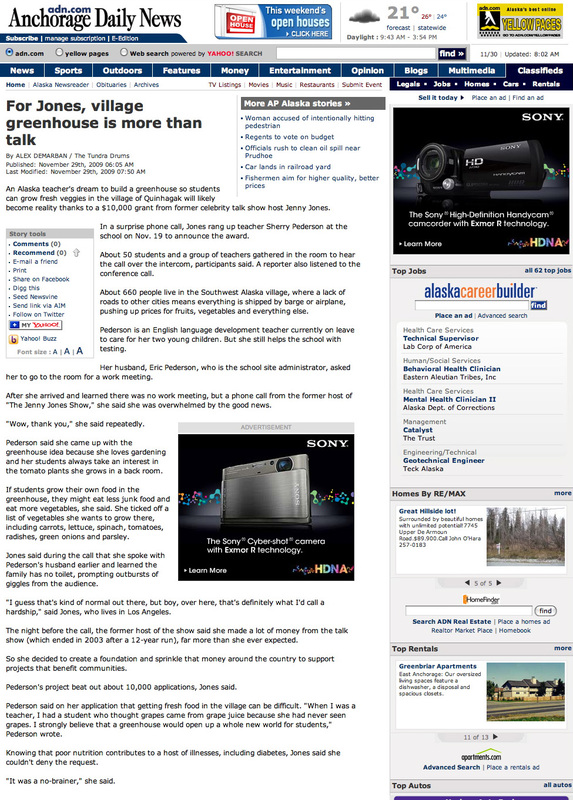 11/20/09: Tim Sobocinski wrote... "Sherry, WOW! How cool and really impressive! I can't wait to hear about all the fun milestones along the way. 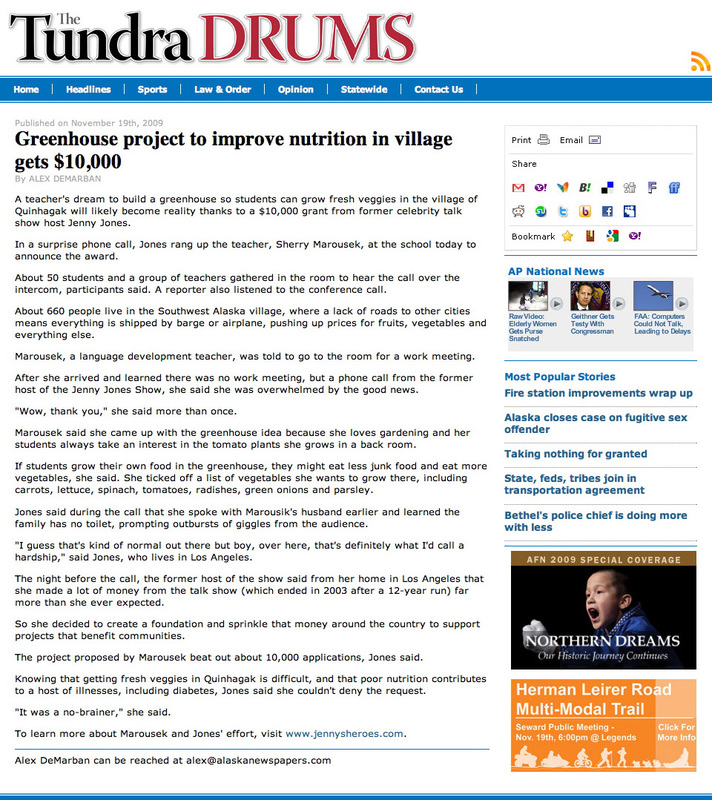 Congrats on achieving such a great thing for the Village!" 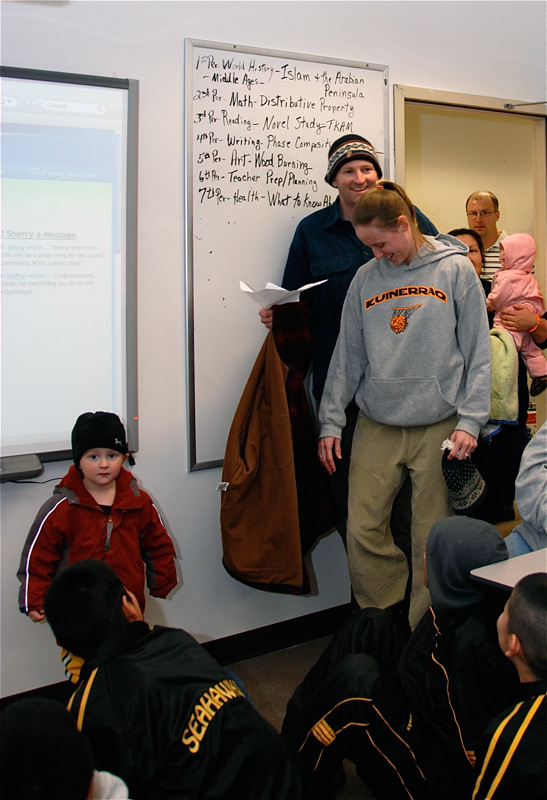 11/21/09: Jack & Jackie Pederson wrote... "Sherry, You go girl....what a way to help others! Grandma Mary would be so proud of this venture!!!" 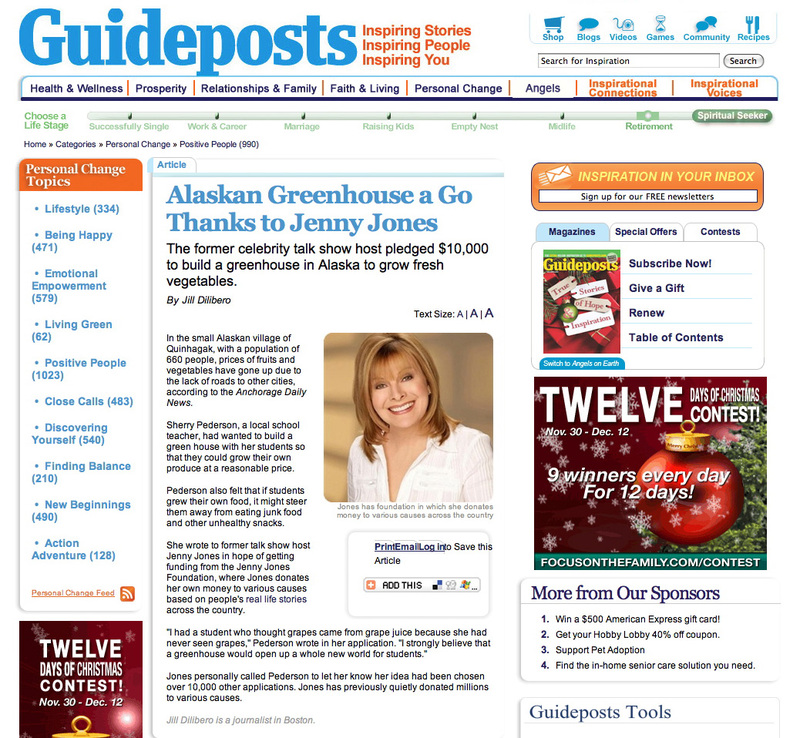 11/21/09: Brenda Marousek wrote... "Congratulations Sherry! I am so proud of you!!! 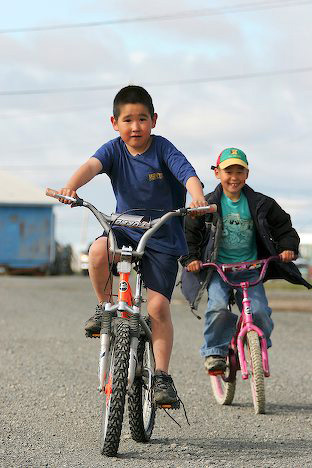 You and Eric have both been doing amazing things for the people in Quinhagak- Keep up the great work. I can't wait to come back and visit the village. I'm always looking up to you!" 11/21/09: Edouard Duong wrote... "HEY SHERRY! I'm so happy for you! I can't wait to finally visit you in Quinhagak and see the greenhouse! And of course see the kids. Congratulations!" 11/22/09: Liz wrote... "What a fabulous challenge! The obvious is that your work is just starting but how rewarding is that? The community participation and long term benefits will have so many positive life-changing effects down the line. And through the years. You certainly are a gem to put all this together. I'm sure you'll reap the rewards for years to come." 11/27/09: Don and Bette Bartig wrote... "Sherry - You are AWESOME girl! Congratulations on the wonderful grant. Those kids will love the new challenge. Jack and Jackie were SO proud to tell us about the grant. It is only the end of November here but our seed catalogs will be arriving soon for spring planting. If you run short of grant money let us know - we would love to ship some seeds to you."